Businesses that make money by collecting and selling detailed records of private lives were once plainly described as “surveillance companies.” Their rebranding as “social media” is the most successful deception since the Department of War became the Department of Defense. We live in a time where often it’s only a handful of seats that can win an election, instead of election campaigns focusing on ideas and policies, the focus is now on influencing voters to win marginal seats. Data mining and surveillance tools that were created for war zones before being picked up by the advertising industry, are now in use against civilians. Privacy laws and regulations haven’t kept up with the pace of technology, and too many people are willing to exploit these loopholes. Business models that involve data mining like Cambridge Analytica and i360 can’t exist without tech giants such as Google, Facebook, and Palantir. Everyone is scraping, selling and analysing our data it’s now about influencing our behaviour, predicting what we will do next. The co-founder of Palantir, Peter Thiel, wasn’t joking when he named his company after the Lord of The Rings stone that is ‘far seeing’. Technocrats take advantage of the fact that most of us aren’t technologically minded, especially the politicians that they pitch their technology too. This is the main-game now to try to see into the future with predictive technology, including predicting crime. In this article I will provide background about the tech giants and how they adopt each others technologies, how data is being used against marginal voters with the debut of i360 software in Australia, and what looms on the horizon. Firstly we will take a look at Palantir and its ties and similarities to Facebook. What is Palantir and how is it connected to Facebook? Peter Thiel co-founded PayPal and sold it to eBay in 2002. He took advantage of a post-9/11 world and created a company that used PayPal’s fraud-recognition software to stop terrorist attacks. This company became Palantir and was founded in 2003. Thiel provided the seed money for Facebook in 2004 and joined Facebook’s board, he is still on the board today. Mark Zuckerberg was only 19-years old at the time, Thiel soon became a mentor and friend. Zuckerberg bragged at the time about how he was able to collect data willingly from people, he called them “dumb f***s”. Initially the only investor of Palantir was Thiel but in 2005 the CIA’s venture arm In-Q-Tel, also became an investor. The CIA was the only customer of Palantir for the next three-years. They had the best engineers working for the company as they tested and evaluated their data mining software to predict terror attacks. Word soon got around and before long they were getting contracts from intelligence agencies, military units, and eventually police departments. Police departments in America were interested in using the technology for its ability to analyse big data to predict crime. Palantir secretly began using the population of New Orleans to test its predictive crime technology in 2012 by offering its services for free. In return they were given free data relating to public records, court filings, licenses, addresses, phone numbers, social media, and non-criminal data to train its software to forecast crime. Palantir’s prediction model also used an intelligence technique called social network analysis (SNA), which looks for connections between people, places, cars, weapons, addresses, social media posts and any data stored in databases. A culture in law enforcement of guilt by association. The profiling of citizens being analysed by an algorithm with no human oversight. There is no clear evidence of predictive technology reducing crime in New Orleans. Despite this it led to more contracts for Palantir, including foreign ones and with the Australian government. There are twenty-four patents relating to Palantir in Australia, the latest tender was signed last year, it’s worth $7.5 million and ends in June 2021. The Australian Criminal Intelligence Commission (ACIC) and different partner agencies use Palantir’s Fusion software, ACICs different partner agencies include: the Australian Federal Police, the Australian Tax Office, the Department of Immigration and Border Protection, and the Department of Human Services. Two bills were introduced in February this year, the Identity-Matching Services Bill and the Australian Passports Amendment Bill. 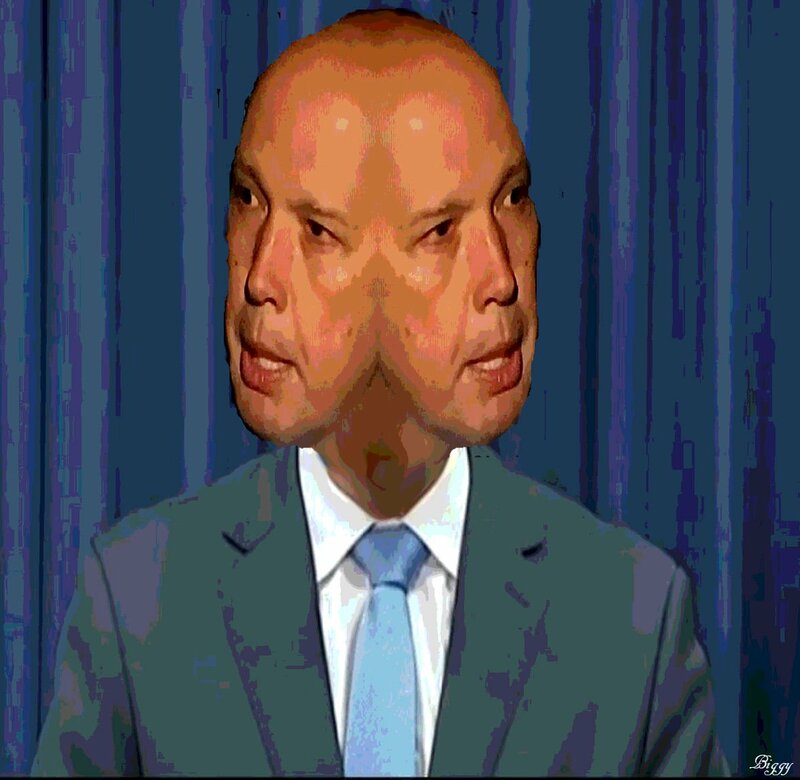 The first bill authorises the Minister for Home Affairs, Peter Dutton, and his department to match photos against identities of citizens in various agencies without a warrant. Media reports about it say that the government was basing this bill on an FBI model, but where did they get their model from? Palantir. Home Affairs is now a huge data collection hub akin to Palantir and it will continue to grow as it collects information, each time a user makes a request for their identity-matching services. For example, say a bank supplies CCTV footage and data with a request, the footage and all of the data associated with the request will be hoovered up into the hub. The reasons for Home Affairs using this information are very broad, and include: criminal intelligence gathering and profiling, community safety (an example is a person acting suspiciously in a crowded, public space), road safety, and the policing of activist communities and protests. The second bill allows Foreign Minister, Julie Bishop to direct the automation of sharing passport data for the purposes of national security, meaning no human oversight, just algorithms talking to each other. Palantir is renowned for its secrecy, the only way to tease out what they’re up to is to keep tabs on their patents. The most recent patent that was granted was in December last year and it relates to ‘crime forecasting’ technology, to help police “to know when and where crimes are most likely to occur in the future.” Another patent pending involves the data mining and analysis of billions and trillions, or petabytes, of records. For context one petabyte equates to 58,292 movies or 13.3 years of HDTV content. These could be bank transaction logs, call data records, computer network access logs, email messages of corporations or other high-volume data. The last patent pending involves household behaviour predictive software that analyses past behaviour in an effort to predict future behaviour. Examples detailed in the patent include obtaining data about household incomes, the number of cars belonging to a household, and your household bills. There are similarities here with Facebook’s ‘Loyalty Prediction’ tool and their ‘Household Audience’ tool. These tools allow you to target entire families in the household. This week the Intercept obtained a confidential document that claims that Facebook is promoting their ‘Loyalty Prediction’ ad service tool. It’s meant to assist advertisers chasing users that are on the verge of disengaging with brands. The Facebook business model has always been about data collection but now it’s moving into territory where it is feeding data into a machine learning program called ‘FBLearner Flow’. Algorithms predicting behaviour aren’t foolproof and because companies are paying for these predictions, there’s a financial incentive to make sure that the predictions are correct. There is concern that Facebook could engineer results. Facebook has been experimenting on its users for years, their mood experiment in 2014 proved that it could change people’s emotions dependent on the content shown to them. It would be tempting to employ this method to change people’s minds about disengaging with brands. GQ reported that Google has an application for a patent in the same realm regarding an algorithm to determine a user’s mood from a “plurality of data sources”; or big data. This technology is basically social engineering and it could be used to sway voters. Next we will take a quick look at the Cambridge Analytica debacle and then on to the debut of i360 software in the South Australian election. In 2014 when Cambridge Analytica data mined Facebook there was a way that anyone could do it using one of Facebook’s own tools. Facebook had a ‘Reverse search tool’ which enabled users to search for people on Facebook just by using a phone number or email address to find their profile. The feature was ‘opt out’ for users and could only be turned off in the privacy settings. You could potentially feed the tool a list of phone numbers or email addresses that could have been taken from data breaches, online leaks, or even electoral rolls. It was only this month after being warned for years by developers of the potential for using the tool to data mine, that they finally shut it down. When Facebook learned about what Alexsandr Kogan was doing for Cambridge Analytica in 2015 they actually paid him to do consultancy work. He was also asked to explain his technique for Cambridge Analytica, and to give talks to Facebook staff about behavioural psychology. Another method that app developers like Kogan used to scrape Facebook data, is by writing code inside their apps to capture your data. It was a Palantir employee that gave Cambridge Analytica the idea to use an app to data mine Facebook. Many are extremely sceptical of Zuckerberg telling Congress recently that he is unaware of what Palantir does and if Palantir itself has ever scraped data from Facebook. The South Australian (SA) Liberals lost the election in 2014 because they didn’t win enough seats to form government. The leader of the party, Steven Marshall, and the SA Liberal State director Sascha Meldrum, looked to America for solutions. In 2016 they purchased a product license for i360 software, it costs around $25,000 per month. They worked together with i360 to customise the software to include Australia’s compulsory and preferential voting system. They began using i360 in 2017 giving them a headstart in targeting marginal seats for the March 2018 election. Dozens of staff and volunteers including Victorian opposition leader Matthew Guy, had a dry run using i360 in the field at the SA election. i360 has been credited for the SA win. The Victorian Liberals have been using it for a while, Queensland is about to sign up and the NSW Liberals, and the Federal government are thinking about it. i360 was created by Michael Palmer in 2009 with a team of nine data scientists with PhDs behind him. It started out as a database to help Republican’s catch up with Obama’s successful use of data during his 2008 campaign. In 2011 the Koch brothers helped out by merging i360 with their non-profit organisation, Freedom Partners. Millions and millions have been pumped into it by themselves and their rich, conservative allies ever since. Making it non-profit means that they can hide who the donors are as well as the money trail. i360 is no longer just a database, they offer a suite of cutting edge tools, including analysis and predictive technology for political campaigning. i360 is primarily funded by the Koch brothers. If you haven’t heard of the Koch brothers, they’re billionaires that fly under the political radar and have made a fossil fuel, fortune. Their company Koch Industries, owns and operates a massive network of oil and gas pipelines, and they make a wide range of products that include: chemicals, jet fuel, plastics, and synthetic fertilisers. They have been funding climate change denialism, to protect their interests through foundations, institutes and front groups for years including an institute in Australia, the Institute of Public Affairs. More in this link and this link, if you’d like to learn more about that. Next we will look at how i360 works, their technology will sound a little familiar. i360 has a multi-pronged approach that involves apps, technology, analytics, predictive analysis, as well as data science, digital marketing and advertising. Over the years they’ve amassed trillions of data points on hundreds of millions of Americans. They use thousands of unique pieces of data and combine data, analytics and predictive modelling for election campaigning. Facebook and Google Adwords work alongside i360, and are their featured digital partners. Advanced predictive modeling enables i360 software to test the effectiveness of thousands of political ads before using them. They use segment models that go above and beyond demographics, they include issues such as whether you want to ‘cut immigration numbers’ or are in favour of ‘raising the minimum wage’. These models can also help them to predict which issue that people care about the most. Knowing these details about people enables them to tailor their ads specifically for you, they personalise the style and tone of the ad, even the aesthetics and colours. These models get updated with new data and refreshed every night. This business model has much in common with Cambridge Analytica. According to the i360 website they have partnered with a number of ‘mobile ID matching’ services instead of using traditional cookies to track your online movements. Cookies are a small piece of data sent from website’s that you browse back to your computer to help identify you so that they can advertise to you. This works for desktop and laptop computers but isn’t good for tracking your movements on mobile devices and for tracking your activities within apps that you visit. They claim to use ‘mobile device IDs’ which are used to identify you via your mobile devices and the apps that you visit. And then there is ‘direct matching’, which matches up apps that you visit while being signed into Facebook or Google enabling you to be found on multiple devices. According to their website this service is 100% accurate, no doubt because they’re partners with Facebook and Google. In fact the technology just sounds like a jargon laden version of the ad-tracking tools that Facebook already offers. More on this below. The Facebook like button has a small piece of code that tracks you as well as the Facebook share button when sharing online content, and then there’s Facebook Pixel. You only need to visit a page that has one of these buttons or Pixel code attached to it for it to collect data about you. What is Facebook Pixel, you may be asking? Pixel allows you to track user movements offline with: “A piece of code for your website that lets you measure, optimise and build audiences for your ad campaigns.” It tracks your activities and reports it back to Facebook and the code doesn’t expire like traditional cookies do. Advertisers can track what users are doing offline even if they don’t have a Facebook account, it’s called ‘shadow profiling’. Google does this too, even if you don’t have a Gmail account you only need to communicate with a Gmail address for one to be created. Asher Wolf has recently written about how the Australian Bureau of Statistics (ABS) with an unnamed telco, did an experiment in 2016 to track people by using their mobile devices. It turned out that the telco was Telstra, the ABS said that their reasoning for the experiment was to estimate temporary populations, and to assist policy makers. It’s not too far of a stretch to assume that this data has been entered into Palantir’s Fusion software, and you have to wonder what else the ABS and the government have been secretly up to in the last couple of years since. The ABS promptly released a statement claiming that the data that they used was non-identifiable, this argument is wrong. Technology has advanced far enough that it can re-identify anonymous people’s data. i360 has a TV targeting service which offers personalised TV ads that can be shown on any channel or program being watched. They’ve partnered with D2 Media (the image below is their business model), and it’s available in America through Dish Satellite TV, or Direct TV. These services and set top boxes are also available in Australia. In 2015 Dish TV partnered up with Freeview as its manufacturer, and it’s of note that Foxtel is currently in the process of transferring its cable service over to satellite. Are there plans afoot for this in Australia in the near future, or are they already in place? The last time that there was a Privacy Act review was ten-years ago. It lasted more than two-years and recommended hundred’s of reforms. Many Australians don’t realise that registered political parties are specifically excluded from the definition of ‘organisation’, so they’re exempt from the Privacy Act. Also exempt from it are political representatives (MPs, and local government councillors), volunteers for political parties, and contractors and subcontractors of political parties. One of the recommendations was for the exemption to be removed. Both major parties ignored the recommendation. In light of recent events with Cambridge Analytica and Facebook I think it’s time to remove the exemption. If political campaigning is no longer a public process and is done in private, being exempt from the Privacy Act is no longer acceptable. i360 has been specifically formulated to sync and capture data from the Liberal Party’s database, Feedback. Feedback is operated by Parakeelia Pty Ltd which provides the party with the software for their data to be entered into. It’s owned by the Liberal Party. Feedback consists of data obtained from door knocking, phone calls, visits to MP offices, email responses, online and call surveys, census data, and social media data. This data combined with their software enables you to pinpoint swinging voters and marginal seats like never before. Similar to Google maps you can click on a location and it will pull up everything that you need to know about a person, including a script to read to them. Volunteers can make calls from home and door-knockers are saved time by the app providing directions to the next targeted voter to win over. The apps save time door knocking and calling, as you only target voters that you need to. Parakeelia transfers money back to the Liberal Party, how is i360 being paid for? “You have a question of a business built on taxpayers funds returning money to a political party: that’s problematic in a way we haven’t seen before,” he said. He thinks that these issues would be avoided if they chose their IT provider through a tender. Unfortunately I couldn’t find any information after these financial years save for a vague tax return from 2016-17. We know that i360 costs at least $25,000 a month, who paid for the SA Liberals to use it and how are the financially struggling Victorian Liberals paying for it? If tax payers are, than that would be all shades of wrong and would take us further into unchartered territory. Following on from software allowances, late last year, new regulations for entitlement spending were quietly introduced by Special Minister for State, Mathias Cormann. Instead of receiving a $2,500 software allowance, for the first time MPs can now spend some of their electoral budget on software and services. These services include: robocalls, SMS and survey services, ‘subject to the limit of your office budget’. Are taxpayers paying for themselves to be politically targeted? NationBuilder has been used by Labor and some of the Greens for the last few years or so, according to the NationBuilder website it’s used in Australia by a number of parties. NationBuilder is used by politicians of all stripes around the world, President Trump used it for his election campaign and it was the platform that was used by both sides of the Brexit campaign. These are tactics that are designed to deceive you and to slyly take your data, Republicans have been doing it in America for years. Every vote counts and every dirty tactic that is available is in use in Australia now. Anything that you see online like email surveys, or in your mailbox that asks for your details, be very wary. Facebook has recently announced a commission of researchers to study social media’s impact on elections to appease the groundswell that is building against their influence in elections. They will be given unprecedented access to Facebook data. Financing for this is coming from foundations including from one of the Koch brothers, the Charles Koch Foundation. There is understandably major concern about this, they’re known for not being the type of donors that just donate and step away, they like to be involved. Despite all of the recent privacy controversy Facebook wants to be able to run facial recognition scans without your consent. Legislators in America are still considering a change to the Biometric Information Privacy Act (BIPA). For years Facebook has fought a lawsuit regarding the handling of biometric data like fingerprints or facial recognition profiles. The plaintiffs argue that Facebook’s photo-tagging system violates the law because photos that are uploaded in this way are done so without consent. It’s of note that even if you aren’t tagged in a photo, their tech can find you. Facebook wants these consent protections neutered. Free access to pictures for years including Facebook owned Instagram, has no doubt sped facial recognition technology along. Facebook has a new tech patent to determine social class, seriously, more here. They also have patents relating to eye activity, and the tracking of your relatives. And Google has a new tool out that will no doubt be shared and tweaked for further use in political campaigning. It’s called Plus Codes and it pinpoints locations extremely accurately. Google wanted to address the problem of high-density slums in India where just 30% have accurate locations for their addresses. There is a general election in India next year. There is so much more that is already here and coming soon: the tracking of your car, listening to your phone calls, looking inside your house and the use of AI that studies CCTV footage to predict crime before it happens. Yes, Sir Tim Berners-Lee is working on a project called Solid. He’s working on a solution of separating apps from the data that they produce. An app built using Solid architecture would ask users where they want to store their data, ownership of your data and access to all of the data that you create. He believes that rather than our data being locked up with a company, we should have the choice of who to share or not share our data with. Who knows what innovations we could come up with ourselves and within our communities? Government’s entering the surveillance game alongside Palantir is chilling to say the least. Decisions based on algorithms without our consent and with no human oversight is a dangerous path to go down. A lot of predictive technology promise governments the world but most of it is largely unproven. The current Privacy Act doesn’t protect us as it should, this isn’t Facebook being dodgy with their user terms, default options and making it impossible to opt out of things, it’s our own government. Election wise its hardly democratic or ethical to target and influence voters secretly using their own data, perhaps even charging taxpayers to do so. The misinformation tactics also need urgent addressing it’s bad enough that our data is being used to manipulate us, to misinform us at the same time for a vote is cruel and immoral. Many thanks to all that have helped contribute to this article. ← Australian Super Funds wanting to invest in America’s infrastructure privatisation, is it ethical?